A pictorial landscape by definition is finite. Cropped, charted, and isolated from a larger spatial expanse, it proposes a singular viewpoint. The specificity of this isolated terrain determines it as a ‘site’ designated for a particular activity, structure, or situation. landescape brings together a group of artists who each represent or recreate simulated environments or landscapes as a situation or set of possibilities to the viewer. While some depict very specific, even didactic scenarios, others are more ambiguous situations for subjective experience by the artist or viewer, or forums for the imposition and projection of fantasy and desire. These are not habitats per se; they are fictive. Nothing is indigenous to these places. Rather, they are mobilized as situations of limitless possibility, each developing its own kind of cultural and geographical ‘ecosystem.’ The viewer becomes actively engaged, or further still, becomes a catalyst within these environments. Perhaps through the participation and imaginative engagement of both artist and viewer these spaces have the potential of becoming fantastic playgrounds, spanning beyond the parameters of the depicted space, providing momentary escape. 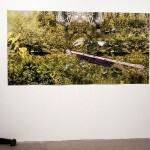 In the Front Gallery, Hanna Haska‘s series of large Light Jet prints depict digitally rendered constructed environments. Rich with densely saturated colours and images verging on garish indulgence, Haska recreates proverbial Edens filled to capacity with the stuff of material and cultural consumption. Many of her source images, like aerial views of Toronto shot from a small airplane, or those of family gardens, are photographs Haska has taken herself. Other more iconic images appear to be clipped from magazines, brochures or catalogues, like floating suites of furniture, satellites, television sets, planets, money, messages in bottles, even tiny cases of Pringles potato chips. The density of these images is reminiscent of the fantastic panoramas of the Flemish masters Bosch and Brueghel with whom Haska shares the format of allegorical narrative characteristic. Like Bosch’s Garden of Earthly Delights(c.1500), Haska presents a narrative triptych that traces a progression from harmony to discord, or more literally, from Heaven to Hell. We are led from lost Paradisiac gardens complete with golden gates, flowing waterfalls, and lush foliage through a churning cosmos of ecological and cultural systems to a cityscape enclosed in a translucent orb, like a tangible biosphere which is being bent and peeled away. Haska articulates earnest millennial anxieties about the racing accumulation and speed of material culture and mass information. The urgency of Haska’s vision of the tumult and confusion of our ethical and cultural climate translates in the extremity of her representations. As her environments develop, they fill to such a point of saturation that they become increasingly uninhabitable and unstable. And in Void(2001), her final image, a tiny jet-packed astronaut is seen making a swift get away, rocketing off into space as the earth collapses in on itself below. In keeping with pictorial traditions of allegory, Haska makes no pretense to create believably illusory places. Iconic images and fragments of space have been sampled and resampled, cloned, resized, flipped, multiplied, and reappear countless times, insistently reasserting the ‘constructedness’ of the environments through the resulting glitches in representation. The use of recognizable Photoshop filters and tools leaves an indexical imprint of Haska’s hand visible in her landscapes. As a result, the traces of ‘cultural activity’ which Haska graphically depicts are equally legible in the qualities and characteristics of the medium itself. These images cannot be fully digested from one vantage-point. While stunning from a distance, they beg to be mined for details that can only be tasted at close inspection. The sheer size of them forces you to physically move and reposition yourself, to travel through the pictures as you would a giant map. Consequently, a direct interface is transcribed between the landscapes charted in Haska’s images and the physical ‘reality’ of the viewer’s movements in the gallery space. 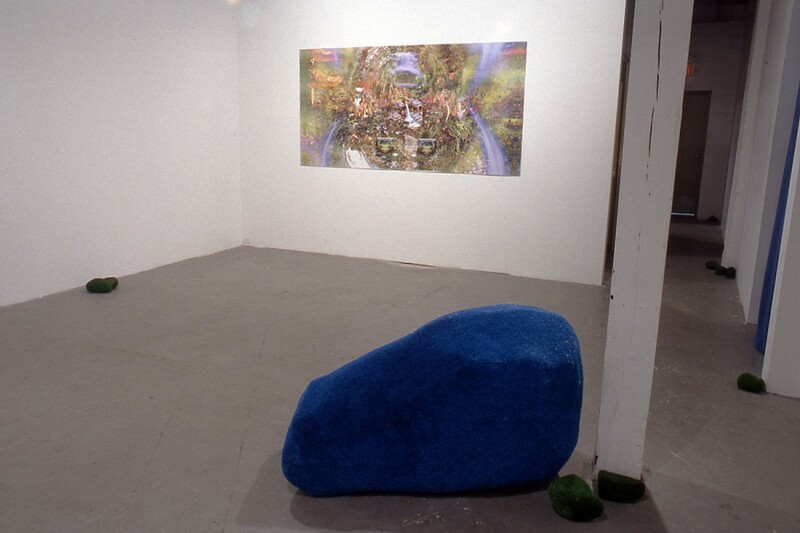 Also in the Front Gallery, clustered like curious pellets of sod, Jennifer Marman‘s Green Rocks (1999) lay about resting on or propped up against architectural features of the space. 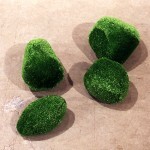 Each rock is carefully tailored with a covering of green Astroturf. With their seamed topographies and recognizable industrial materials, the objects are visibly handmade. 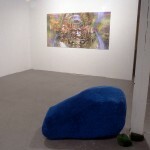 Marman’s Untitled (Blue Rock)(1999), a larger fiberglass boulder, is this time suited in luminous ultramarine blue turf. Like some uncanny island-in-the-round, the rock is at once reminiscent of a body of land and a body of water. These natural references are built into, but skewed in Marman’s rocks. 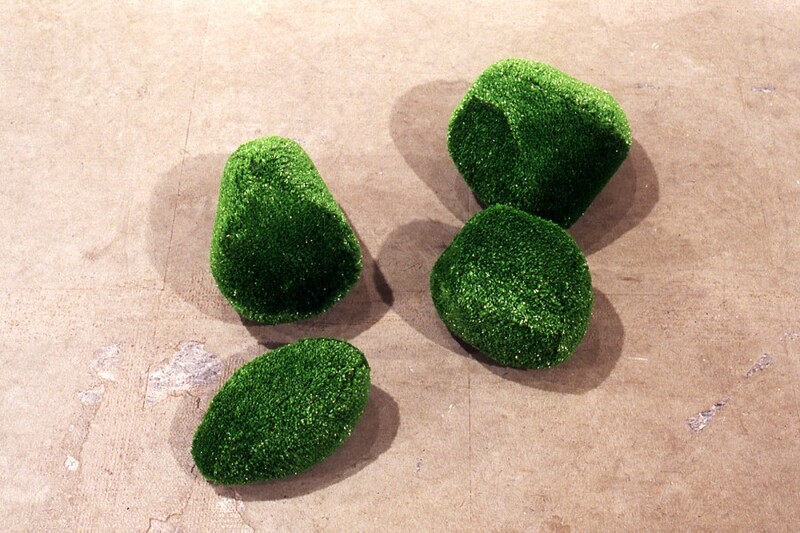 Designed as a grass substitute, Astroturf simulates a natural material, but has since evolved its own system of industrial and domestic functionality. These uses are nullified by Marman’s synthesis of simulated ‘natural’ textures and forms into confused hybridized objects which suggest both minerals and vegetables, while of course being neither. Like rolled-up capsules of concentrated ‘landscape,’ these objects hint at some new space suspended between our world and some other. Marman’s rocks are absurd objects. She offers no particular key to their meaning per se; it is unnecessary, even undesirable. Rather, they ignite relationships which ultimately set up a situation. Their design as units without a set configuration mobilizes them, and together they signal or define zones of space as buoys or pylons might. Through their resulting relationships to one another, and to the particularities of each site as they’re grouped and regrouped, the game becomes equally about the rocks and the animated expanses that stretch between them. The gallery becomes re-situated as some otherworldly geological site in which the viewer becomes something of an explorer. 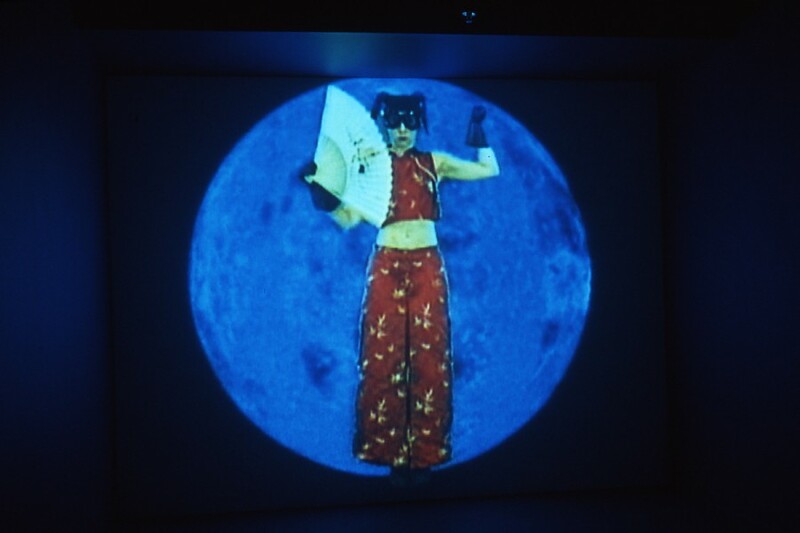 The Back Gallery has been similarly transformed, as Lynne Marsh plays dress-up as an intergalactic super-heroine in her video projection Venus…I see blue. 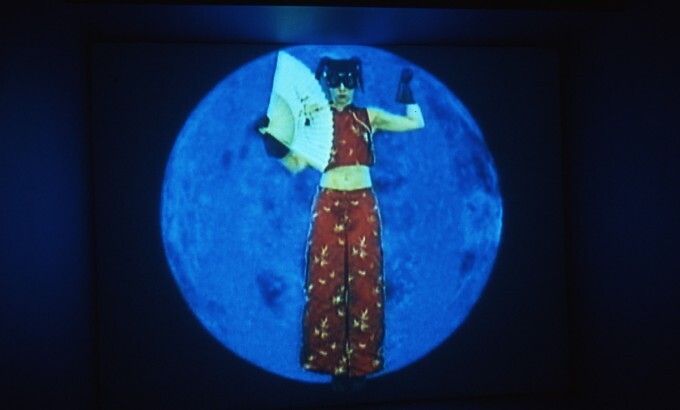 Geared up in goggles, gloves and boots, a cap with peaked ears, and a two-piece red get-up inspired by traditional Chinese dress, Marsh charges, leaps and karate-chops her way through the digitally simulated terrain of the planet Venus. Marsh has sampled and mixed footage of her character running and leaping in place into jerky, gravity-defying feats that allow her to remain suspended in air, kicking up her knickers. At one point her image multiplies into three, each pivoting and chopping the air in synch in a formation comically reminiscent of early morning TV aerobics classes. With virtual fighting games, martial arts, and streetwear among her sources, Marsh creates a hyper-persona that is a composite jumble of stock female pop icons assimilated by her own body and identity. As a result, Marsh’s Venus really straddles the gap between the ‘real’ and the ‘affected’ by articulating complexities of identity and persona as constructs. Although the appearance and actions of her heroine verge on the ridiculous, Marsh herself took karate lessons as a part of the research for this project, a skill which is now a part of her ‘real’ identity. And while she is depicted performing hyper-fabulous physical feats and tricks beyond human capability, she is also at times hyper-tired and hyper-breathless. 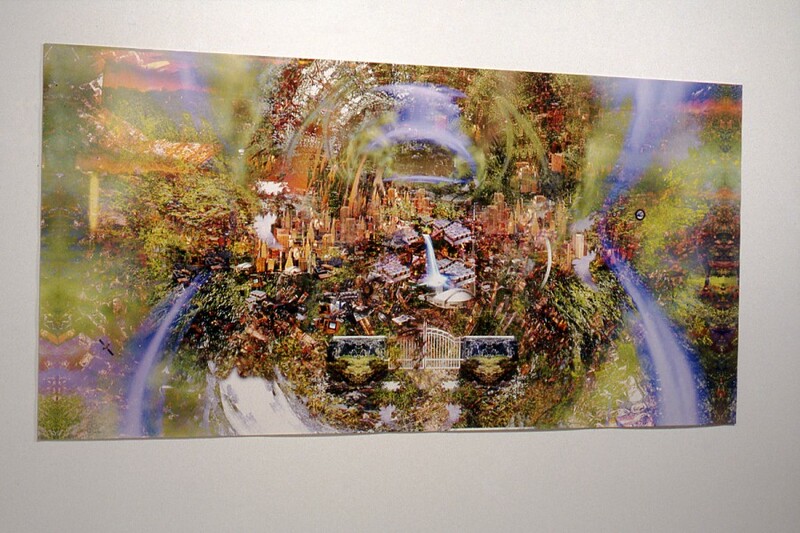 Like Haska, Marsh synthesizes a fictive environment from images sampled from ‘real’ photographic sources. Using footage borrowed from NASA space cameras, she rebuilds the blue mountains and rocky terrain of Venus as a backdrop for her fantasies. 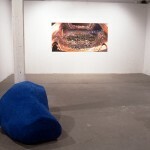 Marsh identifies her re-rendering of the planet as an uncolonized ‘free zone,’ a neutral ground in which liberating imaginative experience is possible. 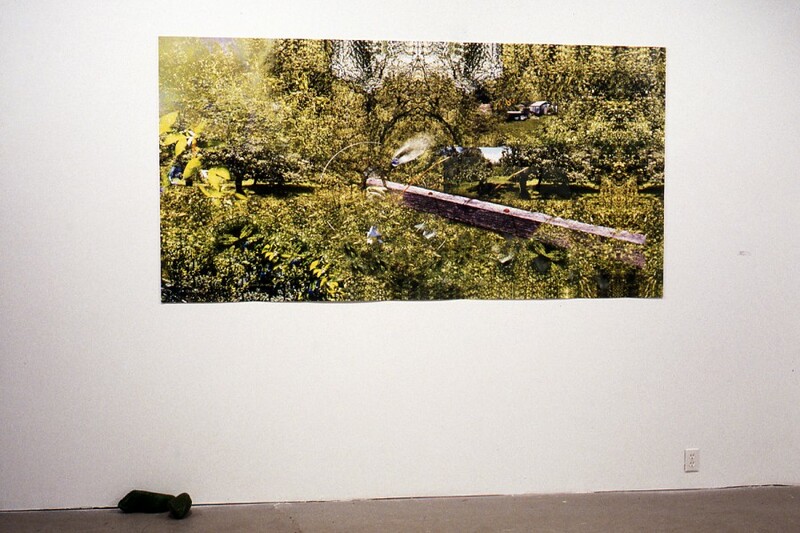 Marsh projects a life-size environment where the figure’s frontal positioning mirrors that of the viewer, and in turn implies a direct physiological and empathetic relationship between the two. This identification is enhanced by the link of Marsh’s movements in the landscape to the format of virtual fighting games, and as viewers we find ourselves engaged in a similarly charged interface. 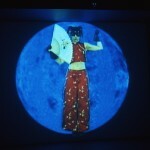 Is Marsh’s Venus an opponent?… an instructor?… a performer?… your doppelganger? All of these relationships are implied at once, and it is the ambiguity of the situation and the terrain that opens up that invites engagement in fantasy and role-play for the viewer as well as the artist. And this effect is essentially the crux of each project in landescape; relationships or situations which span between concrete points or references; that is space. 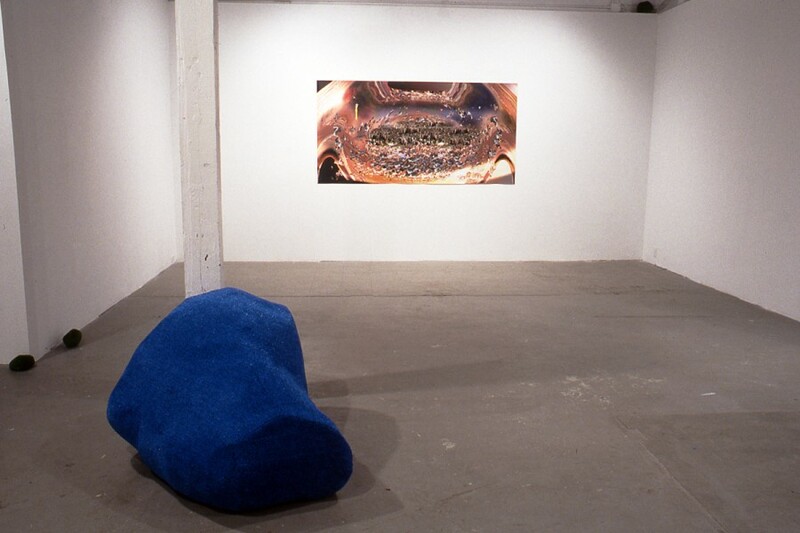 Whether in two or three-dimensions, literal or implied, each artist proposes an environment which escapes the singular perspective and flatness of a traditional landscape. These places often straddle the notions of both ‘here’ and ‘someplace else’. 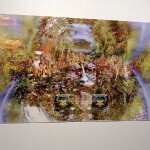 Haska and Marsh create pictorial landscapes that suggest other worlds through a confusion of references from our own. In Marman’s case the ‘landscape’ is implied, and is beyond actual representation. They are situational or relational, and exist in the imagination or through physical experience. The new ‘places’ that open provide environments with the potentiality for imaginative speculation or projection of both artist and viewer. None of these projects boast promise of transcendence or emancipation, but rather incite subtle shifts in perspective which allow for the playing out of fantasy or a momentary escape. The role of the interactive postmodern viewer is essential to each of these projects in order to effectively complete them. In making this jump, the viewer might split or leave him or herself momentarily, like the disorienting blip in consciousness that happens in the hitch of a hiccup or a sneeze.